Balún's Prisma Tropical is out July 20. The Puerto Rican-based band Balún has always embraced technology, ever since its debut release in 2006. The group's sound is synth-heavy, but there was also something else, an attitude maybe, that warmed the proceedings from within. The sound of Prisma Tropical is the most complete realization of the musical creation they call "dreambow," a stylistic play on dembow, the pulse of reggaeton. Having seen them perform live, I have an even deeper appreciation for how the band values its sonic environment when even an empty Coke bottle became part of their arsenal of sound. The sound of Prisma Tropical is the most complete realization of the musical creation the group calls "dreambow," a stylistic play on dembow, the BOOM-chacka-BOOM pulse of reggaeton. "Teletransporte" is a perfect expression of the group's dreambow vision. It is one of the many tracks on the album that artfully crafts a delicate dreamscape atmosphere, this time by floating vocalist Angélica Negrón's voice over synth parts. Percussionist and beat maker José Olivares masterfully layers subtle rhythms against each other stripping away everything but the essential clicks and clacks of traditional Puerto Rican drums. Bassist/folklorist Nora Ruiz adds a Puerto Rican tiple, a stringed instrument that dates back to the 18th century. Raul Raymundi's guitar becomes another electronic element of the gorgeous electronic mix that brings to mind the approach to guitar by the British art rock band King Crimson. One of the hidden treasures on the album is the transition from the gorgeous melody of the Puerto Rican cuatro guitar on "Carolina" to the cascade of sounds, both synthetic and organic, that is "El Espanto." The syncopated folk melody is approximated and hinted at, then deconstructed and juxtaposed, to create what may to some sound like just some kind of quirky rhythm but is actually a complex expression of the genius of their musical vision. There are plenty of other examples of why this album deserves attention. Clocking in at 16 tracks, its almost as if the band couldn't stop itself from creating. Repeated listening to the album (which was produced by Lawson White) reveals new things to listen to and new ways to appreciate Balún's musical vision. Prisma Tropical is yet another example of how incredibly talented musicians are expanding our expectations of music from Puerto Rico. 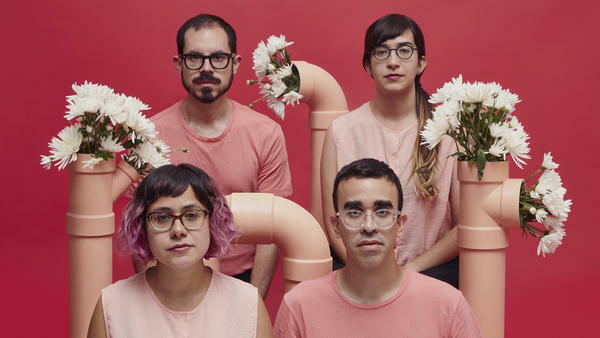 Balún is truly one the island's best musical exports in a very long time.